This rewarding hike leads to a lake with crystal waters, little islands, and a granite backdrop. The trail steadily gains elevation leaving forest behind save for the few hardy trees growing up in the cracks between the granite. Views of the Yosemite Creek drainage are great with Mt. Hoffman peeking over the ridge, however the creek itself remains hidden far below. The trail levels out and traverses through the forest with scant views until it reaches Halfmoon Meadow. The wildflowers pop in this beautiful grassy meadow walled in by the ridges. The trail steeply zig-zags up a seemingly infinite amount of switchbacks to climb a quick 700ft/210m of elevation to a couple of lovely meadows and the junction with the Grant Lakes Trail. Take the trail to the right passing through a flower filled meadow, but keep an eye on your footing as it is marshy in spots. The trail then steeply drops 300ft/90m through the willows before traversing through the forest to the lake’s shoreline. A crumbling granite wall backdrops this beautiful lake with a small island harboring a couple of hardy trees. 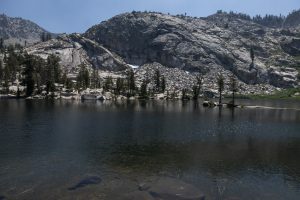 Another lake sits in a basin to the east and below the towering ridgeline, but the official trail stops at the first lake. On the way back, hike up to exceptional views at Ten Lakes Pass and consider visiting Ten Lakes (see Ten Lakes). Trailhead: Look for the small, signed parking lot for Yosemite Creek/Ten Lakes along the Tioga Road. The trail begins on the north side of the road.